Resolve to keep current backups of your files, and one archive. First, there are three levels of backups for websites and blogs: content, structure, and settings. If you’re using a hosting service, they may be making backups for you, but you should still run and download backups. In a typical WordPress environment, you can use a plugin to backup your database (content) and WordPress files (structure). You should also export your theme settings. Next, access your host’s C-Panel and download a complete backup of your hosting environment. This will include htaccess file WordPress boot files (wp-config, wp-load, wp-login, etc.). A good backup structure is to keep an archive one year old, and three generations of current backups. If you’re using a full-service hosting solution, like HubSpot CMS, you can still export your site content to keep an archive. The hosted solution will keep their own backups within their system. Why keep an archive? Recently I was working on a site that was infected with a virus in the database. Turns out, the virus had been in the database but dormant for over three months. It was less expensive to restore the old database and recreate the new content than it would have been to clean the database. Helpful hint: Add a recurring appointment in your calendar to download your backups. There are a few simple steps you can take to improve your website and blog security. Keep your hosting software up to date. If you’re using WordPress, update your plug-ins, keep your active theme up to date, and install WordPress updates. You should remove any plug-ins and themes you are not using. Look at your list of website users and get rid of any accounts that are no longer active. For active accounts, require users to change their passwords and require strong passwords (a mixture of letters, numbers, and symbols). Also, we recommend your content publishers or blog authors have user names that are not their public name or email address. Why give hackers half the information they need to break into your site? Never have a username “Admin” or “Administrator. If you’re using WordPress, we recommend installing a firewall plugin, and spending some time to configure it. Many firewalls will block failed login attempts from the same IP address, and you can list user names to block automatically (like “Admin”). Most hosting services will have a built-in firewall, so you don’t have to worry about it. SSL, or Secure Socket Layer, is a security protocol to encrypt data between your website and the user. SSL shows by using "https" in the address bar and showing a lock symbol. It doesn’t have to be expensive. Check with your hosting company and domain name registration company for SSL certificates. Unless you’re making transactions on your website, you won’t need a high level of certificate. Also, the lack of SSL negatively affects your website search results or SEO. Search engines like Google are constantly evolving and changing their algorithms on how they rank website pages. There are a few constants that will help with your SEO. Search engines are trying to produce results that link to pages relevant to what people are searching for. Writing your website pages to provide clear information to people you’re trying to reach is the first part of SEO. Including properly named images (i.e., executive-director-kate-smith.jpg instead of img054667.jpg), with alt tags and page meta descriptions are easy ways to enhance content descriptions. There is a lot more you can do, but start with the basics. See this post: 5 SEO Basics for Quality Content. Over the next year, Google will begin using the mobile version of your website page for indexing and ranking. If Google spots separate URLs, mobile users will be shown the mobile URL and desktops will be shown the desktop URL. However, the mobile version will be the indexed content in both cases. So, implement responsive design if you haven't already — and check that the content that appears on mobile appears in the order of priority you're after. Get rewarded for more words! You’re the expert at what you do, so tell the world how you can help them. With changes in user behavior and search, longer pages that provide meaningful information are rewarded in search results. Using long-form content allows you to provide useful information or a guide to conquer a problem. Consider pages or blog posts of 2,000 plus words for the topics or issues that are important to your audience and related to what you do. For an example, see our Guide to Inclusive Language. Google AMP (accelerated mobile pages) and most social media networks want images that are 1,200 pixels wide or larger. When you put your page URL in the Facebook or Twitter new post box, they will try to find an image on the page to display. Consider using large featured images in your design, and optimize your primary image to load quickly. You can use page tools to resize an image smaller and still allow that image to be available for social media posts. The social media channels will resize the image based on the view platform. Posts with properly sized, quality images will be clicked on and shared much more often. Google has announced the end of Google Plus for individuals and changes for business pages. If you were using G+, make sure you remove social media sharing links from your website and author information. Remove any other dead links on your website. 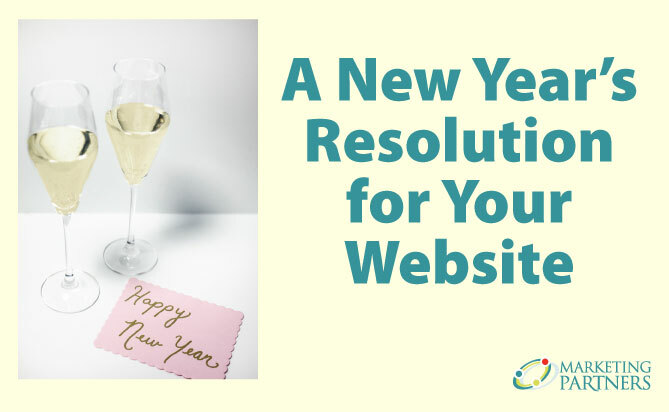 Make your new year’s resolution to have a happy, healthy website and blog. Take a look at your site and decide which steps you need to take. Schedule backups and set reminders to download weekly. Save your first backup as an archive. Update your website hosting software and apply any security patches. This includes updating plugins and themes. Delete any unused plugins or themes. Change your password to a strong password. Consider changing your user name as well. Delete any unused or old users. WARNING: Be sure to change any content from old users to be owned by the administrator so it does not get deleted. Backup first. Name images with people-friendly file names. Make sure each image has an ALT description. Make sure each page has a unique meta description. Check out your website on your mobile phone and a tablet. Fix if needed. Optimize new images on your website and blog at 1200 pixels wide and use page tools to size for display. Create at least one long-content page about what matters to your audience and is related to what you do. Remove dead links, such as Google Plus.